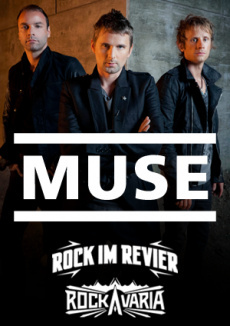 Muse are an English rock band from Teignmouth, Devon, formed in 1994. The band consists of Matthew Bellamy (lead vocals, lead guitar, piano, keyboards, keytar), Christopher Wolstenholme (bass guitar, vocals, keyboards) and Dominic Howard (drums, percussion, synthesisers). They are known for their energetic and extravagant live performances and their fusion of many music genres, including space rock, progressive rock, alternative rock, symphonic rock and electronica. Muse have released six studio albums: Showbiz (1999), Origin of Symmetry (2001), Absolution (2003), Black Holes and Revelations (2006), The Resistance (2009) and The 2nd Law (2012), with one upcoming studio album, Drones (2015). They have also issued four live albums: Hullabaloo Soundtrack (2002), which is also a compilation of B-sides, Absolution Tour (2005), which documents several of the bands performances such as Glastonbury Festival 2004, HAARP (2008), which documents the bands performances at Wembley Stadium in 2007, and Live at Rome Olympic Stadium (2013), shot in 4k and taken from the bands Rome show during The 2nd Law World Tour. Black Holes and Revelations earned the band a Mercury Prize nomination and was named the third best album of 2006 by the NME Albums of the Year. Muse have also won numerous music awards including five MTV Europe Music Awards, six Q Awards, eight NME Awards, two Brit Awards—winning "Best British Live Act" twice, an MTV Video Music Award, four Kerrang! Awards and an American Music Award. They were also nominated for five Grammy Awards, of which they won Best Rock Album for The Resistance. As of June 2012, Muse had sold over 15 million albums worldwide. Register now your Email address and never miss events, dates and news for Muse.